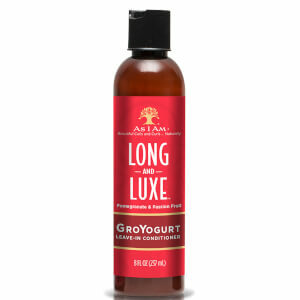 Treat naturally curly or coiled hair types to the Long and Luxe Strengthening Shampoo from As I Am. Harnessing the powers of Pomegranate, Passion Fruit and Certified Organic Aloe Vera, the lightweight formula gently cleanses the hair and scalp, whilst promoting longer, stronger locks to leave strands fortified from root to tip. Helps to minimise tangling and combing damage for easier styling. Rub an ample amount of shampoo between palms and gently lather through wet hair. Massage hair and scalp, leave on for 5 minutes and rinse thoroughly. Repeat if necessary. Aqua/Water/Eau, Aloe Barbadensis Leaf Juice*, Disodium Cocoamphodipropionate, Trideceth-7 Carboxylic Acid, Disodium Laureth Sulfosuccinate, Cocamide MIPA, Polysorbate 20, Punica Granatum Fruit Juice*, Passiflora Edulis Fruit Juice, Hydrolyzed Lupine Protein, Serenoa Serrulata Fruit Extract, Linum Usitatissimum (Linseed) Seed Extract*, Melia Azadirachta Leaf Extract, Glycyrrhiza Glabra (Licorice) Root Extract, Origanum Vulgare Leaf Extract, Camellia Sinensis Leaf Extract, Betaine, Royal Jelly, Keratin, Hydrolyzed Keratin, Niacinamide, Phytosterols, Caffeine, Biotin, Glycerin, Trifolium Pratense (Clover) Flower Extract, Equisetum Arvense Extract, Urtica Dioica (Nettle) Extract, Cola Acuminata Seed Extract, Piroctone Olamine, Hydroxypropyl Methylcellulose, Maltodextrin, Acacia Senegal Gum, Polyquaternium-7, Polyquaternium-10, Phenoxyethanol, Caprylyl Glycol, Citric Acid, Caprylic Acid, Fragrance/Parfum, Beta Vulgaris (Beet) Root Extract, Sodium Benzoate, Ethylhexylglycerin, Tetrasodium EDTA, Ceteareth-60 Myristyl Glycol, Silica, Red 33/CI17200, Propoxytetramethyl Piperidinyl Dimethicone, Benzyl Benzoate, Limonene, Linalool. Enjoy 3 for 2 on selected As I am.